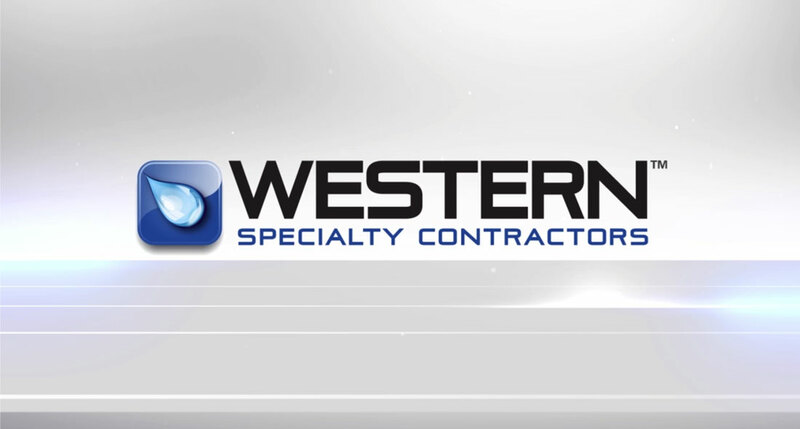 Dedicated to quality and innovation, Western Specialty Contractors is America’s largest specialty contractor in masonry, concrete, waterproofing and facades restoration made up of a national network of skilled member companies and workers. The team must ensure the work progresses as planned while trying to accommodate 606 apartment tenants. Space management: a lot of debris needs to be removed and a lot of material needs to come in to the job site. Western/Brisk acted as general contractor in order to manage 17 separate work crews, coordinating tasks to maintain schedule requirements. Precise planning of deliveries and debris coordination is required. Low PSI for cleaning which resulted in the need to hand scrub the stone. Access: we were not allowed to anchor anything (scaffolding, cables, etc.) to the stone. Super Heavy Duty Scaffolding system and specially-designed carts were used to transport the stone from the street to setting areas. Specially-designed coring rig to maintain perfectly straight core holes. Collaborated and coordinated with many New York City agencies to recreate original grand staircase as well as to minimize the impact on traffic during its construction. Handling and transporting approximately 4 million pounds of stone to off-site storage. Anchor points needed 3,500 pounds of stone. Horizontally coring through 5 feet of existing marble to create anchor holes for new cornice face stones. 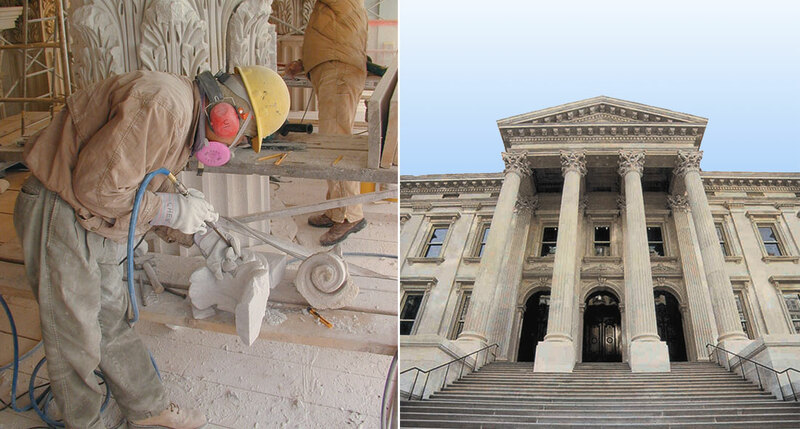 A combination of in-site and off-site restoration was utilized. After several trials, we determined methodology that would achieve the required results for in-site crack repair, patching and surface preparation prior to painting. All surface-mounted ornamental cast iron parts were removed and tagged for identification through the off-site restoration process. Broken ornamental cast iron parts were categorized for replacement and replicated parts were modeled. All removed and replicated parts were painted, drilled with new anchorage locations and delivered back to the building. 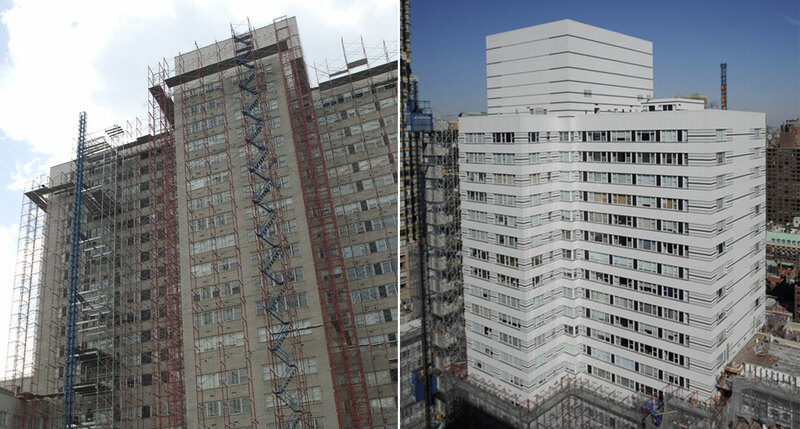 Following a series of mockup trials, the appropriate combination of cleaners and applications was determined for each of the facade materials. Aggregate displacement was no longer a concern and the result was a clean facade. We applied a silicate-based coating to all remaining terra cotta in order to create a highly vapor permeable, water-repelling, protective layer to the aged terra cotta. The coating, along with full re-pointing helped to ensure the life of the facade. Cast iron window bays were specified to be restored off-site, however when we began the work, we discovered that the cast iron was built into the structure. While a tremendously interesting architectural finding, complete dismantle of the cast iron window bays was no longer possible. 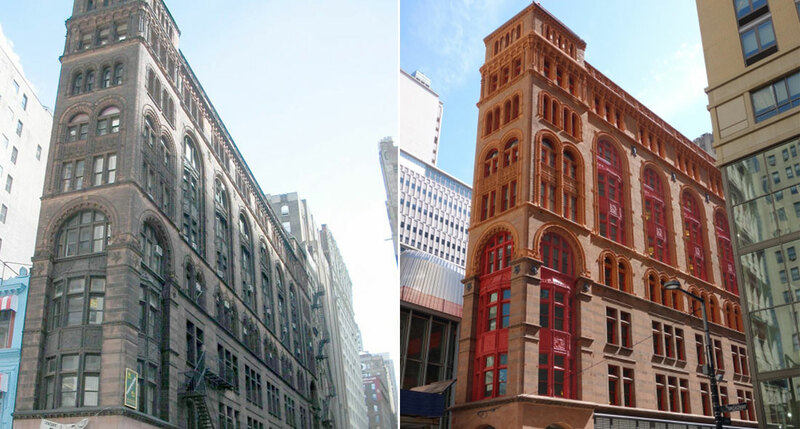 The brick and terra cotta facade was specified to be cleaned with a sponge blasting system. However, due to the age of the materials (circa 1889) and the poor firing techniques of the time, there was heavily exposed aggregate in the brick/terra cotta. Subject to displacement with even low-impact sponge blasting, a completely different approach was needed. The fire skin of all terra cotta units had greatly worn away. 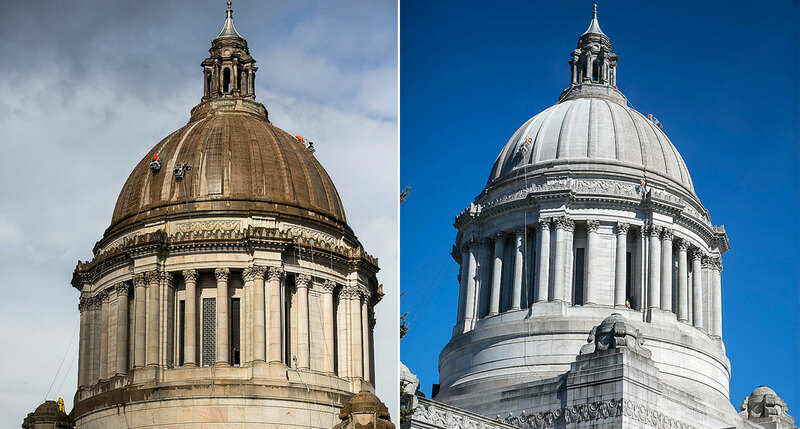 While replacement was included in the project scope, additional treatment for the remaining terra cotta was needed to extend the life of the building. All exterior stone work had to be removed from the project while renovations were occurring, but there was limited space and no room for a lay down station on site. Noise restrictions within the city prevented many of the renovation measures necessary. All stones were carefully removed from the exterior and systematically catalogued. Stones were then transported to an offsite facility until later when they were reinstalled in their exact original placement. Created a “sound deadening” device space, certified to be compliant with decibel level limitations. Proactively met with OSHA prior to the project to develop a working relationship. We offered to have their student inspectors visit the site for “real-life” experience. 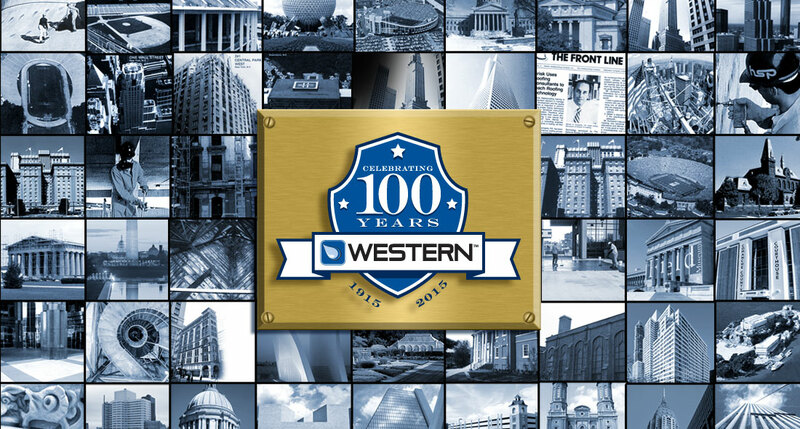 Since 1915, Western has stood by dedication to quality craftsmanship. 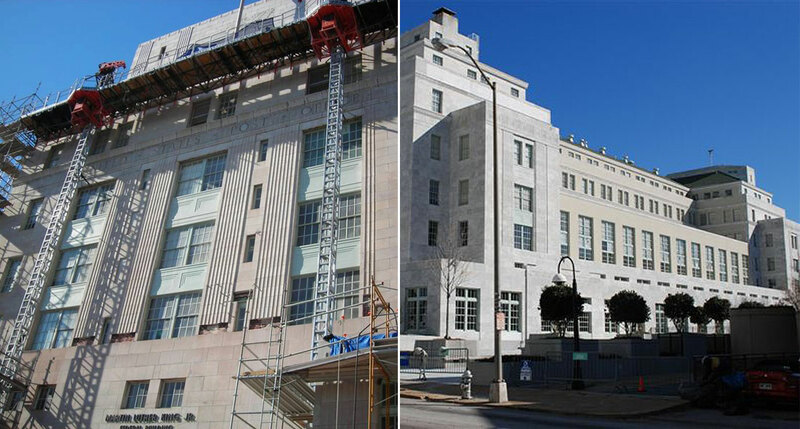 Family-owned, the company has evolved to become America’s largest specialty contractor in masonry, concrete, waterproofing and facades restoration. 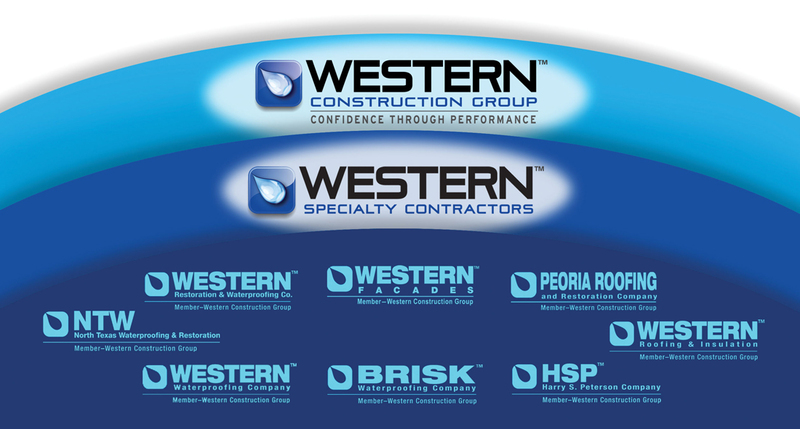 Now, with a century of experience and more service offerings than ever before, Western Construction Group and all its member companies and branches will now be known as Western Specialty Contractors. 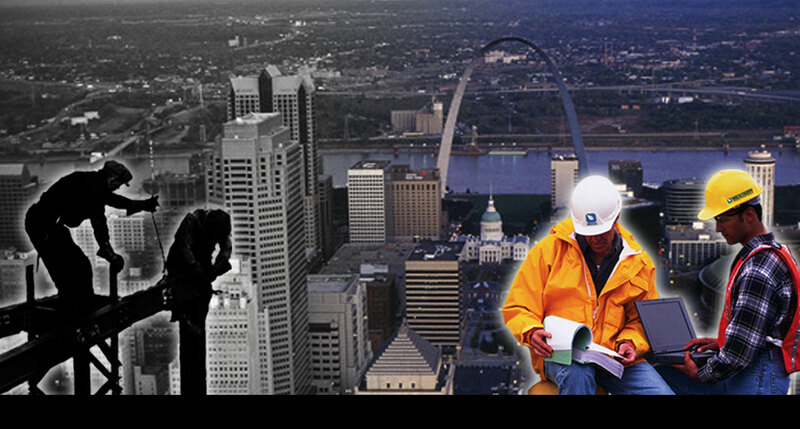 Work your way up the ladder with Western and become a part of America’s largest specialty contractor in masonry restoration — learn more about internship opportunities and recruitment here. “If you’re ready for the rewards that come from being part of the best, we want you on the Western Team.” – Ben Bishop, Jr. CEO — Learn more about our people culture here.